1 of 1 Cut shrimp into large chunks. Combine with celery, mayonnaise, juice, tarragon, mustard and seasoning. Refrigerate. Cut zucchini into 2 x 1/2-inch sticks. Dip in egg and coat in panko. Roast at 450 degrees for 25 to 30 minutes, turning once. Season with salt and pepper, if desired. 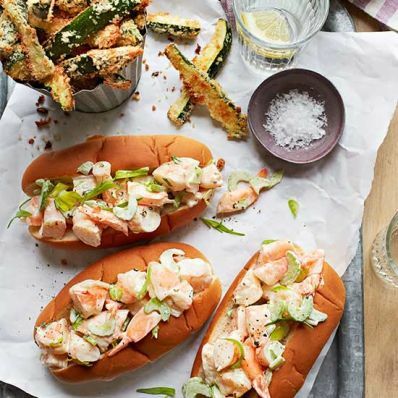 Divide shrimp mixture equally among buns and serve with zucchini fries on the side. Per Serving: 16 g Fat, total, 379 kcal cal., 683 mg sodium, 19 g pro., 2 g fiber, 32 g carb.